A recipe for the best chicken nuggets made from scratch! They’re easy, quick to make, and perfectly cooked on the inside, with a crunchy coating on the outside. 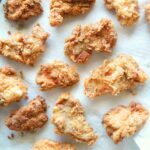 When you have toddlers and young kids yearning for chicken nuggets, this is a recipe you can count on to supersede both the quality and the flavor of drive-thru nuggets. The best chicken nuggets undoubtedly come from home…plus, I get a little peace of mind knowing exactly what’s in them and how they were made. I imagine you will too. But, before we can fry them up, we need a few bits of knowledge under our belts. Let’s start with the trickiest one first. If you do not have a thermometer to judge the temperature of your oil, try this flour trick: Sprinkle in a bit of flour into the heated grease and it sizzles up right off-the-bat, your oil is good to go. However, if it sizzles up, blackens and puts off an unpleasant odor, I think it’s safe to say you need to crank down the heat. Now, if you add a sprinkle of flour and you hear…crickets, no sizzle, nada — it’s time to turn the heat up. Once you’ve got the oil situated, making chicken nuggets at home is really very simple. As much as I hate to admit it, I like my nuggets similar to McDonald’s chicken nuggets as far the shape goes. McDonald’s chicken nuggets are flat, with a greater surface area than most others. The more surface area, the more breading. The more breading, the more crunch. See where I’m going with this? To make your chicken nuggets like McDonald’s, you’ll need a mallet or a rolling pin. You’ll use the mallet to pound out chicken breasts so they are about 1/2″ in thickness. 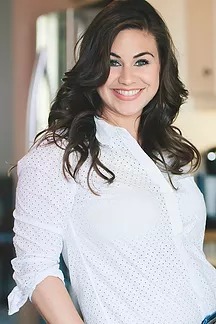 Alternatively, you could start with chicken cutlets (thinly sliced chicken breasts) and do away with the pounding altogether. So what exactly are we working with here, anyway? The best chicken nuggets come from the breast of the chicken. Once the chicken has been somewhat flattened, you’ll cut them into nuggets. Start by cutting each breast into strips about 2″ wide. Then, you’ll cut the strips into pieces 1 1/2 – 2″ in diameter, and it’s time for the dredge. A dredging station is a set up consisting up three breading trays. Each tray contains something different and they usually go a little something like this: Plain Flour dredging tray, Egg Mixture dredging tray, and Seasoned Flour dredging tray. The nuggets take a swim in each tray, and then they are breaded and ready to be fried up to crispy perfection. These chicken nuggets are crunchy, crispy and fry up fast. 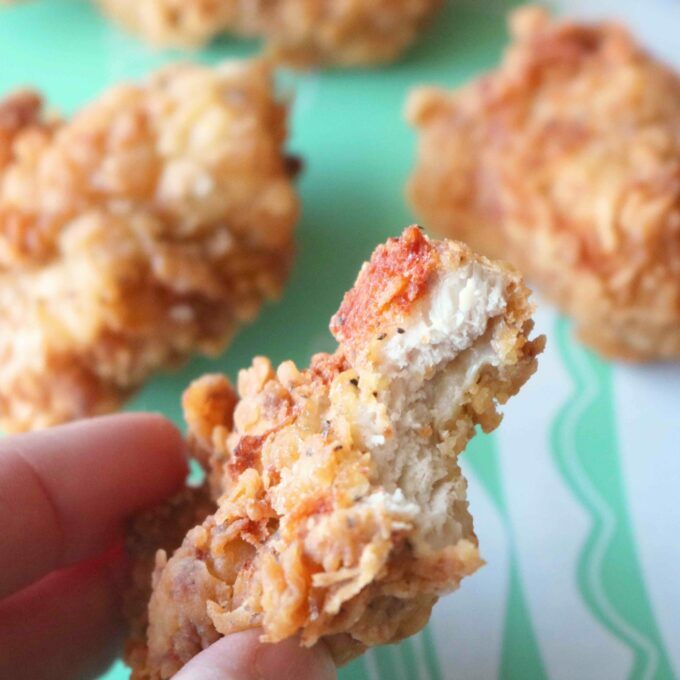 I would even go as far as to say these just might be the best chicken nuggets you (and your littles) have ever tasted. Homemade makes all the difference in the world. Enjoy. 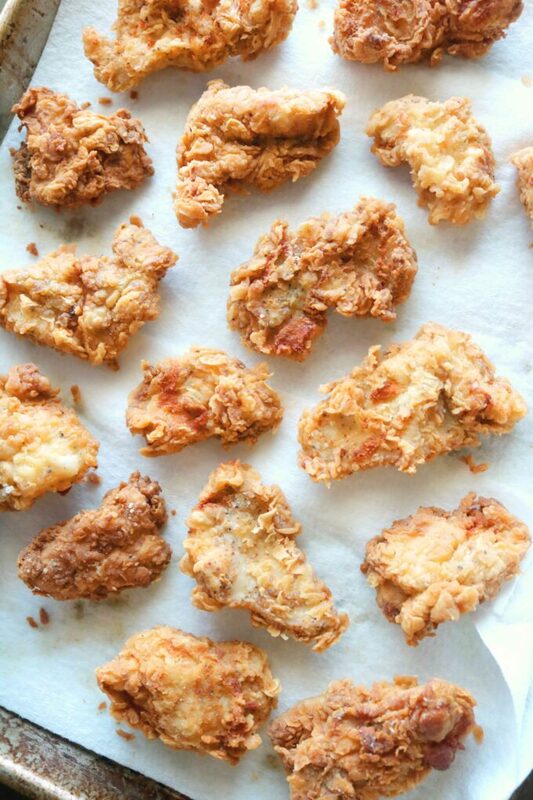 A recipe for homemade, crunchy chicken nuggets. On a large work surface, using the tenderizer side of a meat mallet (or a rolling pin), pound out chicken breasts so that they are no more than a 1/2" in thickness. Cut the pounded out breasts into strips, about 2" wide. Then, cut the strips into pieces 1 1/2 - 2" in diameter. Sprinkle with 2 teaspoons of TAK Seasoning, and toss to combine. Set aside while you prepare your dredging station. Have ready three breading trays, pie dishes or shallow pans. In the first pan, add 1 cup of flour. In the second, whisk together milk, eggs and hot sauce. In the last tray, mix together 1 1/2 cup of flour and 1 teaspoon of TAK Seasoning. Before you begin dredging the chicken, bring the oil to proper temperature. Add oil to a large cast iron skillet or Dutch oven over medium-high heat, and allow to reach 350-375°. .Have ready a wire rack, with a few paper towels underneath to catch any oil drippings. To dredge the chicken, thoroughly coat it in the tray with plain flour, followed by a dip in the egg mixture, and then, a thorough coating in the seasoned flour. Carefully drop nuggets into the oil, taking care not to overcrowd the skillet. You will likely need to fry in 2-3 batches. Fry nuggets for 2 minutes, then turn and fry for 2 minutes more. Transfer cooked nuggets to wire rack to cool slightly.